Thank you all for being here, I feel honoured to be at this gathering. I would like to thank American Friends Service Committee and Joseph Gerson for inviting me. I first came across AFSC when I met Joseph at an anti-nuclear conference in Hiroshima, Japan, in 1998. We have stayed in touch since, sharing information and analyses about issues related to peace and anti-war activism. 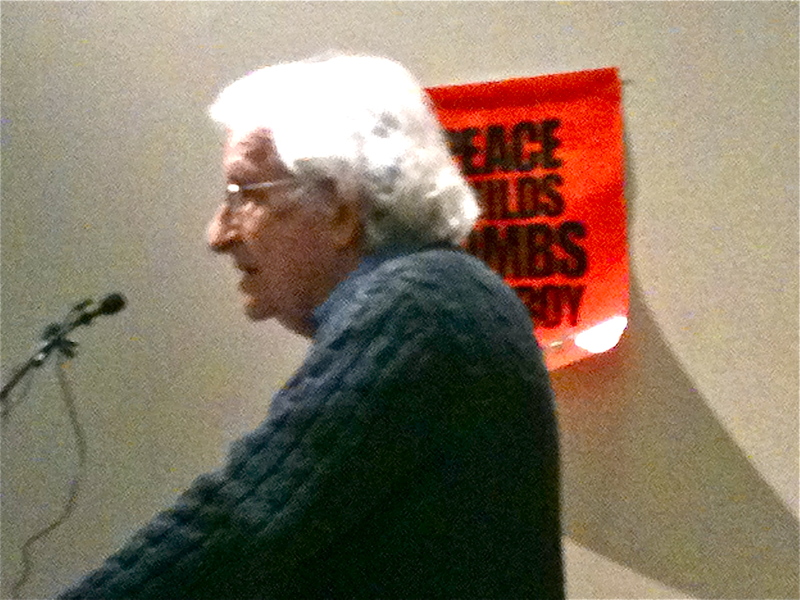 I feel particularly honoured and humbled to share this space with Noam Chomsky who is of course is a veteran of the global struggle for justice and peace. His ideas and analyses inspire millions not only in America but around the world. I look forward to hearing him speak this evening. I remember the prolonged standing ovation he received in Pakistan in October 2001, when he entered a packed hall to deliver the Eqbal Ahmad memorial lecture series. 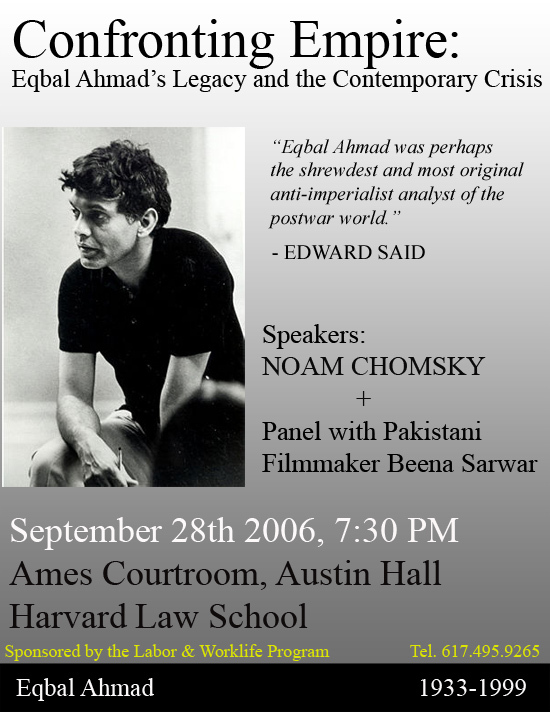 Eqbal Ahmad, as some of you may know, was the prominent Pakistani political analyst and thinker although to compartmentalise him within national confines seems a bit unfair, given his involvement in freedom struggles around the world, starting with the anti-Vietnam war movement in America in the 1960s. He was one of the Harrisburg Eight as the group of activists came to be known who were accused of conspiring to kidnap Kissinger. I mention these linkages to illustrate the global nature of our joint struggle for justice and peace not only in our home countries elsewhere. Globalisation isn’t just about capitalism. It has its advantages for those struggling against the negative effects of capitalism. Very briefly about myself and my work – I work with the Jang Group as Editor of Aman ki Asha (a peace initiative between India and Pakistan started by the Jang Group and Times of India, the two largest media groups of the two countries) – http://www.amankiasha.com. What gives me hope in these dire times is not just how people are coming together for justice and peace, but their growing realisation about the need to strengthen democratic political systems and the rule of law. I’m not going to touch upon the Mid East situation here, as I’m sure Prof Chomsky will address that in depth. I will however say that it saddens me to know that Pakistani mercenaries are involved in the brutal suppression of dissent in Bahrain and elsewhere, and I hope that the situation does not continue. The common challenge we face – besides the economic challenges and the rising gap between the rich and the poor – is the rise of rightwing, militant, fascist ideologies. There are militant anti-abortionists, Tea partiers and KKK supporters in America’s south and mid-west. There are Hindu hardliners in India who threaten those who celebrate Valentines Day. There are the Nazi revivalists in Europe and white supremacists in England. There are the Zionists who want to deny the Palestinians space to live or breathe. And there are Muslim militants who in the name of religion are creating havoc particularly in Afghanistan and Pakistan, and striking in other countries too. The challenges posed by religious or cultural hardliners are particularly strong in countries with weak democracies where there are tensions between modernisation and cultural norms. In Pakistan, hundreds of women are killed every year on the pretext of ‘honour’ – often a co-accused man is also punished. In Bangladesh last month a 14-year old girl died after she was whipped, or lashed following, an order by community elders led by a priest. Some 503 women reportedly have been subjected to public flogging since the year 2000. Gender violence is common in countries across the Middle East too, as well as in India – where an additional aspect of gender violence is female foeticide. According to the Indian government, 10 million girls have been killed, either before or immediately after birth, by their parents over the past couple of decades despite a law banning scan tests to reveal the foetus’ gender. The United Nations says an estimated 2,000 unborn girls are illegally aborted every day in India (A cry still unheard: The Menace of Female Foeticide in India, April 7, 2011). So while no religion or community has a monopoly on such behaviour, in most cases the violence remains contained within a particular community or country. However, in the case of the Taliban or Al Qaeda, the ideology has crossed these barriers and poses a threat to other societies as well. I was just at a ‘trialogue’ in Berlin, a closed-door conference between parliamentarians, journalists and academics of Afghanistan, India and Pakistan organised by the Fredrich Ebert Foundation (an NGO linked to the Social Democratic Party). There was a consensus that the biggest threat facing all our countries is what is termed as ‘terrorism’ or armed militancy based on Islamic ideology. Islam is a religion of peace, which forbids most strictly taking an innocent life or your own life, and which defines ‘the greater jehad’ as the struggle to overcome your own weaknesses. But those committing violence in the name of Islam have their own version of the religion, which they use to indoctrinate potential suicide bombers and armed militants. I don’t want to go into the post-colonial, post-Cold War, neo-capitalist factors and policies behind this factor, except to remind us that it was American foreign policy, supported by Pakistan and Saudi Arabia, that transformed the Afghan war of national liberation into a religious struggle in the fight against the ‘godless communism’, as Eqbal Ahmad said in his prescient talk ‘Terrorism, theirs and ours’, at the University of Colorado, Boulder, October 12, 1998. I would like to put Pakistan in the context of this situation. This is a country where, since it was born in 1947, no legitimately elected government has yet been allowed to complete its tenure. 2008 – present– Democracy again, for how long? So Pakistan has never had an uninterrupted democratic, electoral process. No legitimately elected government has been allowed to complete its tenure. In addition, Pakistan’s geo-politically strategic location has led to its becoming a proxy battleground for various international players – America, Saudi Arabia, Iran, to name some. This foreign interference, coupled by the greed of unelected leaders for power, has seriously damaged democracy and the democratic process in Pakistan. The so–called Islamic laws imposed by Gen. Zia, coupled with the indoctrination, training and arms provided to the jihadis or militants during the Afghan war contributed to a veritable army of indoctrinated militants who now want to occupy power and impose their version of religion on the entire state. The current situation looks grim. To many in Pakistan and around the world, the country seems to be on an irreversible downward slide. I argue that is not the case, and that there are many positives we can further build upon. It is also essential to strengthen Pakistani parliamentary politics and the rule of law. ELECTIONS Firstly, despite all the indoctrination and conditioning, Pakistanis have always voted on factors other than religion – the electorate has never yet voted the religious parties into power. POLITICAL DIALOGUE Second, for the first time, there has been no political victimization following a change in government. Former enemies sit next to each other in parliament, which would have been unimaginable ten years ago. (The issue of missing persons continues to be of concern, but the government is addressing it, it has set up a commission, which has finalized its report). There is an active caucus of women Parliamentarians on Peace and Reconciliation, incorporating parliamentarians from all political parties. MEDIA, JUDICIARY, PARLIAMENT Pakistan has a vibrant media, an independent judiciary, and a functioning parliament that has already taken some significant steps towards reversing the policies and legacies left by past military dictators. LEGISLATION – WOMEN, CHILDREN, WORKERS Parliament has also passed important legislation to protect women and children and workers, who now have the right to seek legal remedies against dismissal and can no longer be dismissed without case, as in past. SOCIAL WELFARE – Minimum wages of un-skilled workers have been increased, from 4,600 to Rs 7000 per month. The Benazir Income Support Program has been introduced as a social safety net providing relief to over 4 million poor families, including IDP’s, flood victims and the victims of bomb blasts. It includes a scheme of soft loans to set up small businesses. ECONOMY – Despite the inherited problems of rising inflation, power shortages, worldwide recession etc, a situation worsened by the unprecedented floods last year, the economy is getting back on track. In 2007 foreign remittances were 6.4 billion dollars. These have increased and are set to cross the 11 billion dollar mark this year (a record). Exports are expected to exceed 24 billion dollars this year – a record for now. Despite floods, agriculture has progressed. From wheat import, Pakistan has become wheat-exporting country (exported 6 lac tons this year). EDUCATION – 2011 has been declared as the Year of Education; the government has acknowledged education as a moral obligation of the state for all Pakistani children, and has declared education as a basic & enforceable right. HEALTH – The PM has launched an emergency Anti-Polio plan, to eliminate this disease by the end of 2012. Polio was almost eliminated before, but has again spread. ENERGY – Alternate energy sources including wind power are being exploited and steps are being taken to meet the energy challenge. DIALOGUE WITH INDIA – It is important to note that the dialogue process with India has resumed and on a government level, there is a clear acknowledgement of the need to continue this process. The previous government of Gen. Pervez Musharraf also sought peace with India, but he played a double game — fighting the foreign or Afghan militants, while patronizing the local militants. I believe this is the first government that is not using these militants as a foreign policy tool or strategic asset. Now let’s come to the challenges. SECURITY ESTABLISHMENT VS GOVT – Pakistan’s security establishment has not yet fully come on board the policy of pro-peace with India, and anti-jihadi. Is it a coincidence that the Mumbai attacks came just four days after President Zardari’s address to the Hindustan Times Conclave in which he said Pakistan had a no-first use nuclear policy? “Who does he think he is?” is a comment reportedly made by a senior security official. Similarly, the government’s attempts to bring the military intelligence agencies under civilian control have been met with great resistance. For decades Pakistan’s military establishment has been leading the country’s defence and foreign policies. For decades the international community has been negotiating with this military establishment. For decades, politicians have been out in the cold, and the political process hostage to Pakistan’s security situation. CONDITIONING – Gen. Zia banned student unions, the nursery of politics, in the 1980s – which the elected government has still not restored. He also imposed various amendments to Section 295 of the Pakistan Penal Code making it a criminal offense be disrespectful towards the Quran and the Prophet. TRAIN – The damage that has been done, and the conditioning that has been developed, cannot be reversed within a few years or by just one elected government. Pakistan’s pro-Jihadi, anti-India policy is like a speeding train. It does not come to a halt the moment the brakes are applied. It continues for some distance before it can come to a stop and start changing direction. That process has begun, but it will be a long, slow process punctuated by the rage of the jihadis who are no longer the blue-eyed boys of the state. They are now capitalising on the frenzy created by the ‘blasphemy issue’ to gather momentum. BLASPHEMY LAWS – There were no ‘blasphemy murders’ in Pakistan until 1992. That year, after a court case, death became the only punishment for those convicted under 295-C, the section which provides for redress against dishonour to the Prophet Mohammad. All laws can be misused and abused but the blasphemy laws gave a particularly strong handle, as the Human Rights Commission of Pakistan has put it, to the unscrupulous to settle their scores. According to a study by the National Commission for Justice and Peace (NCJP), 1058 people have been accused under 295-C since 1986 when it was made part of Pakistan’s Penal Code, of which about 50 per cent are Muslims. MURDERED – Although no one has yet been executed by the state for a blasphemy conviction, at least 32 people have been extra-judicially killed after being acquitted or while under trial, or even without having been formally charged. The issue is highly emotive, allowing the religious parties to successfully conflate the issue of disrespect to the Prophet with blasphemy. Even senior government ministers pay lip service to this issue, vowing to kill someone who has blasphemed. This is the one issue that unites all orthodox Muslims. • A Christian village was attacked when rumours spread that some of its inhabitants had desecrated the Quran. Subsequent investigations have indicated the involvement of the land mafia. • A factory owner was murdered by his workers when one of them, whom he had had a quarrel with, incited the workers into believing that the man had blasphemed. • In another case, factory workers lynched a fellow worker against whom similar allegations cropped up – the victim was a Hindu who was apparently involved or interested in a Muslim girl. Some kind of rivalry, enmity or jealousy has been found to be behind all such cases. AASIA BIBI CASE – The issue cropped up again after a Christian woman, Aasia Noreen was sentenced to death by a district court in August 2010 under 295-C, for an offence allegedly committed a couple of years earlier. According to details of the case she had had a quarrel with some Muslim women from the village after they refused to drink water she brought them on the grounds that she was Christian. She reportedly argued with them defending her faith and in the process said certain things about the Prophet Mohammed that they found offensive. INTENT & OTHER RELIGIONS – I want to flag a few things here: one, that the original Section 295 of the Pakistan Penal Code (derived from the Penal Code of the British colonisers) provided redress if religious sentiments were hurt – no matter to which religion they belonged. And, the intent to offend was taken into account. The amendments introduced by Gen. Zia weighed the law heavily on the side of Muslim religious sentiments being hurt and also reduced or removed the critical matter of intent. CLASS – Two, in this case too, some kind of rivalry or jealousy played a factor in the case being filed against Aasia – in this case based on class. Most Christians in the Punjab are descendents of converts from the lowest class or caste in the pre-partition years. Village women would not have refused to take water from a non-Muslim Western woman. A decade or so ago, a low caste woman would not have argued back. POLITICAL MOTIVES – And three, this case, like most blasphemy cases, was registered a few days after the alleged incident. In other words, elements from the religio-political parties had time to go and ‘work’ on the women involved, to inflame passions and to convince them to register a case. So essentially, the blasphemy laws, because of the ease with which they can be registered, and the emotions against the victims that they arouse, have become a political tool. PROCESS – In the due course of law, death sentences handed down by lower courts have to be confirmed by the High Court, and then the Supreme Court, before the sentence is carried out. And even after that, the President may reprieve a condemned prisoner’s sentence. PROPAGANDA – However, moved by her plight, Punjab Governor Salmaan Taseer tried to help Asia Noreen. He visited her in prison and promised to help her obtain a presidential pardon. The religious militants used this to mount a successful vilification campaign against Mr Taseer, painting him as a blasphemer for helping a ‘blasphemer’ and suggesting changes in the law. Their campaign falsely accusing Taseer of committing blasphemy was amplified by the media and gained such momentum that to the extent that after he was killed, they could publicly glorify his murderer. Equally shockingly, several priests refused to recite his funeral prayers, and large numbers of lawyers hailed the murderer as a hero for having killed a blasphemer, and offered to defend him without any fee. CFD – As the propaganda against Mr Taseer and reforms in the blasphemy law gained momentum, some of us got together to form a citizens’ group to inject some rationale in the public discourse. This nation-wide umbrella group of political parties, trade unions, professional organisations, NGOs and individuals was named Citizens for Democracy (CFD). We were planning an information seminar on the blasphemy law issue to try and influence public discourse when Salmaan Taseer was shot dead by his own guard. • CFD came out strongly against the cold-blooded and cowardly murder of Salmaan Taseer. We raised questions about how the assassin, Malik Mumtaz Qadri, was assigned to the elite force guarding the Punjab Governor even though he (Qadri) was earlier removed from the Special Branch because he was perceived as a security threat. We asked why the other guards did not open fire, as per standard operating procedures in VIP guard duty? (In Qadri’s confession after his arrest, he said that he had told his colleagues what he was going to do and asked them not to open fire, as he would surrender). 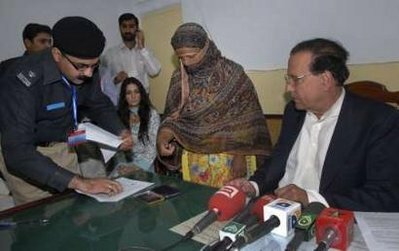 • We have requested the Supreme Court to take Suo Motu notice of pronouncements by a cleric who at a public gathering on Dec 3, 2010 (well before Mr Taseer’s murder) offered a Rs 500,000 reward to kill Aasia Bibi if her death sentence was not confirmed by the High Court. This request for Suo Motu notice was signed by over 400 prominent citizens and submitted to the Supreme Court in February, but we have received no response. • We have also demanded legal action against those who indulge in hate speech and threaten those who support amendment of the ‘Blasphemy Law’. SHAHBAZ BHATTI – Barely two months later, the Federal Minister for Minority Affairs, Shahbaz Bhatti, the only Christian member of the cabinet was killed, also for supporting changes in the legal procedure regarding 295-C.
RULE OF LAW – Trying to change public discourse; CFD takes the stand that no one has the right to take the law into their own hands and kill anyone, regardless of whether they are accused of blasphemy or any other crime. SIGNATURE CAMPAIGN – On March 12, there was a public signature campaign around these issues at which over 15,000 signatures were collected in one day. Details of all these events and statements are available at http://www.citizensfordemocracy.wordpress.com. CFD is not an NGO or a political party. It’s a platform for people come together and assert their support for a progressive Pakistan. We hope that this assertion gives strength to the political parties who share this goal. This is the Pakistan that needs to be strengthened and projected, the people coming out in public at risk to their lives, of their own volition, rather than the mullahs that organise sponsored rallies to which they herd their followers. What is essential now is for all political parties and parliamentarians to take a clear stand on this issue, that no citizen should have the right to cast aspersions on the faith and beliefs of another citizen or to term someone else a ‘blasphemer’, ‘kafir’, or ‘non-Muslim’. * Intelligence agencies must not engage in vilification, incitement, perpetration, and condoning of violence, and must stop protecting those guilty of doing these things. * Media must exercise responsibility and agree on a code of ethics that prohibits the uncritical transmission of the condoning or encouragement of violence. CONCLUSION: None of this will happen overnight. But if the political process continues, the positives outlined earlier will increase. We may never have a perfect system in Pakistan – no country in the world has a perfect system. But I believe we are moving in the right direction. That is what gives me hope, despite the challenges. How come there is no picture of you? I don’t think I am too optimistic. I have outlined the major issues that I see before me. If there is demoralisation, perhaps it’s because the ‘doom and gloom’ mainstream media chooses not to see these factors because disaster and sensationalism are what make the headlines and the money. The speech is compact as well as patriotic. On a world forum, maligning one’s country is not pragmatic move, though knowing that things are not that positive and optimistic. I cordially congratulate you on this brave yet wise move. Hats off, Beena. Keep it up! Where can I find Chomsky’s paper, by the way? Thanks. 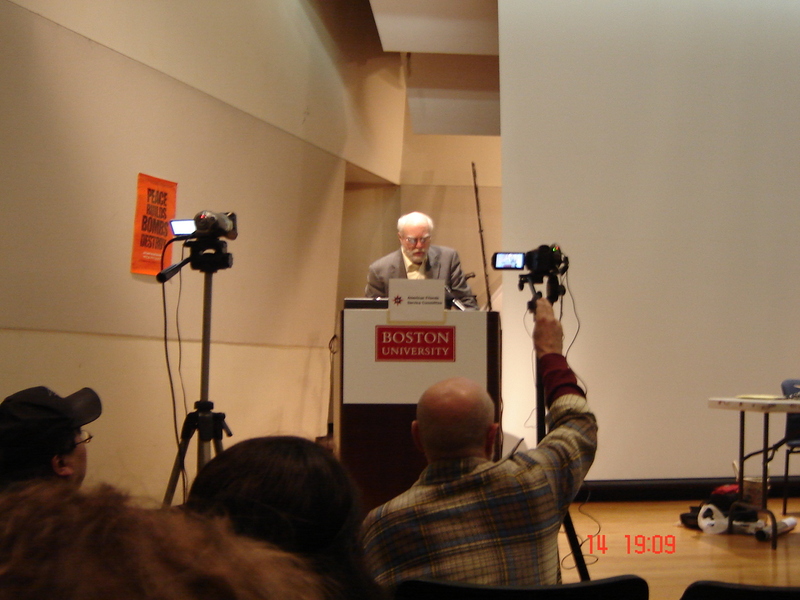 Chomsky did not have a paper, but the contents of the talk will be available on video soon. I’ll post the link as soon as I have it. There were two other colleagues of Eqbal Ahmed, namely, Feroz ahmad and Ejaz Ahmad. Any clue of the whereabouits of Ejaz? It was he (late 70’s) who taught me looking away from the beaten paths. I owe my introduction to Hamza Alvi’s works to him. Feroz Ahmad passed away some years back (I remember interviewing him for the Frontier Post). Ijaz Ahmad I believe is based in India.